Hot Full Carousel is responsive slider WordPress plugin for making slideshows of images and text. This plugin can work in old-style fixed width mode, but it’s also possible to enable the responsive mode. In this case, responsive slider WordPress plugin will adopt its width to the available screen space. Development of responsive websites is not an option anymore. It’s a requirement! Percentage of users who access websites using mobile devices is increasing constantly. Therefore, if you are making your responsive site in WordPress, in order to create it properly, you need both responsive theme and responsive plugins. Hot Full Carousel is responsive slider WordPress plugin by HotThemes. It will fulfill your need for tool for making responsive slideshows on your site. What’s important for this plugin to make it work as a responsive slider? You need a responsive theme, or at least a container inside your current theme which has width parameter set to 100% (full width of the screen). We have already developed several themes based on Hot Full Carousel: Hot One Page, Hot Explorer, etc. Please check the demos of these themes to get a better idea what this responsive carousel can make for your site. After installation of the responsive slider WordPress plugin, you should drag the Hot Full Carousel widget into the widget position. Then you would get numerous options related to the plugin functions. 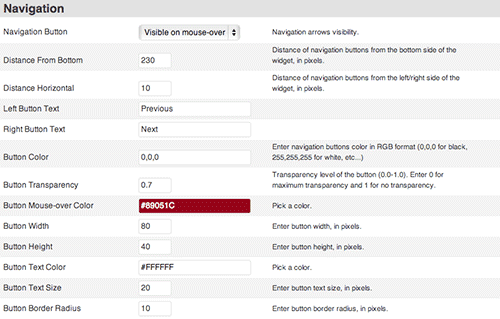 The second pane of the responsive slider WordPress plugin’s settings is related to the text style. If you need to enter some text that describe images of your slideshow, this panel has settings which determine the text box background color, transparency and font sizes inside the text box. Hot Full Carousel rotates slides both automatically or after click on the buttons which are linked to the previous and the next slide. The third panel of the widget settings are related to the navigation buttons. You can set the buttons style, size and position here. Also, you can set the text for the buttons, colors and transparency. This panel has 3 parameters only. You can set the animation speed and pause between slides change (in milliseconds). Also, it’s possible to select one of 10 offered easing types. So far, we elaborated all aspects of the responsive slider WordPress plugin, except the most important part. How and where we select the images and enter text or HTML for the slides? For this purpose, widget settings has 20 panels, one for each of 20 available slide slots. Inside each panel, you have the same parameters: Image file name and heading and text for the text box. Also, you can enter link for each slide if you need the slide to be linked. In this case, if visitor clicks anywhere on the slide, it will be redirected to the link you defined here. Please don’t forget to enable the slot in order to see it on your site! It’s important to mention that you must have at least 3 published slides in parameters in order to make the slider start functioning.